We’re finding inspiration for our swim shorts from all over the world. Some from the turquoise water of the Maldives and some from the summer nights at Ibiza. For our Palm swim shorts we found the inspiration in Abu Dhabi, capital of the United Arab Emirates. In Abu Dhabi you find palms everywhere from the city center to the desert. 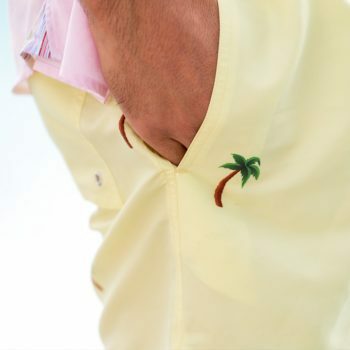 For us the majestic palm represent strength and endurance, surviving in the desert. We wanted to capture this feeling of strength and put it on a pair of swim shorts. Our Palm swim shorts are truly inspired by these palms in the desert. The yellow background paints the desert with a few palm trees standing strong. These swim shorts will be a sure thing if you want to stand out at the beach this summer, or at the desert perhaps? Our Palm swim shorts is offered in a 2-pack together with our light blue Pineapple x Watermelon swim shorts. This is the perfect combination for when you can’t decide of just want a little change on your vacation. When creating our palm swim shorts we put a lot of work into finding the right materials, fit and feeling. These swim shorts are made from 100% polyester with quick dry technology. The inside mesh is made practically soft for an all-day comfort. Practical pockets are carefully made to met att the needs for a day at the beach.